I had planned on making a fall-flavored farro risotto, which I’ve made before and love, but it turns out I was too lazy to stand and stir for 30 minutes (I opted for sitting on the couch sipping coffee instead). And honestly, the stirring just wasn’t necessary this time since pureed butternut squash gives the farro that creamy risotto-like consistency. It also didn’t hurt that I toasted the farro in rendered pancetta fat. Everything’s better toasted in rendered pancetta fat. Everything. So, I cooked up my toasted farro in some white wine and chicken stock, then stirred in the butternut squash, smoked paprika and red pepper flakes. This farro goodness is topped with cardamom honey toasted pecans, sage and crumbled pancetta for a deliciously warm, smoky sweet bowl of comfort food. I’d like to promise you a break from all of this fall food, but I don’t see an end in sight as I’m also slightly obsessed with planning our Thanksgiving menu with my mom, and I’ve got all of these autumnal recipes to test out. So, bear with me while I cook every squash and cranberry in sight. Simply omit the pancetta for a vegetarian option! Preheat the oven to 350°. Set a large saucepan over medium heat and add the pancetta. Cook until the fat renders and it becomes crisp, about 10 minutes. Remove the pancetta from the pot with a slotted spatula, leaving the fat in the pot. Add the shallots and cook for 3 – 5 minutes, or until the shallots begin to soften and caramelize. Add the farro and toast it in the pot for about 2 minutes, stirring continuously. Pour the white wine into the pan and stir until it’s absorbed by the farro, then add the stock. Bring to a slow boil, then reduce the heat to low, cover and let simmer for 30 minutes, or until the farro is tender and the stock is almost completely absorbed. While the farro cooks, toast the pecans. Place the pecans on a lined cookie sheet and sprinkle with the cardamom, then drizzle with honey. Try to get them as evenly coated as possible, then place them in the oven for 7 minutes. Remove and set aside. When the farro is done, stir in the butternut squash, paprika and red pepper flakes. Add salt here if needed. 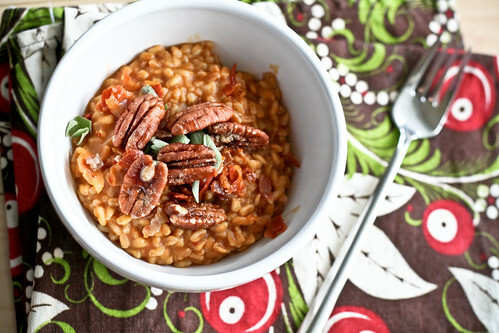 Remove from heat and serve in bowls topped with fresh sage, pecans and pancetta. I seriously want you to come and be my personal chef. Please! I can’t offer benefits but I can make sweets like no one else:) You cook dinner, I’ll make dessert! I’m with you. All autumn all the time. Though I made stuffing last night, meaning to blog it, and added way too much liquid and it was NO good. This looks lovelyâ€”I don’t usually keep cardamom around but it sounds yummy in this! I actually have all those ingredients! I know! I bought two butternut squashes (2/$1) when I went to get my apples at the local orchard yesterday here in East Central Illinois (yes, it is as exciting as it sounds), the farro and pancetta and cardamom I have from my latest trip up to Chicagoland, and the smoked paprika I purchased when I was in Portland, OR in May. Sage is still in my garden, and I have agave too! I KNOW! Yay! This alone would be totally enough for me, but my husband and two sons may like some protein with this. Chicken wouldn’t be right, right? Beef? Doesn’t sound good either. Pork maybe? Some kind of sausage? maggie – You can sub cinnamon for the cardamom and it’ll be just as tasty! Peggasus – i LOVE when I have all the ingredients I need! As for protein, simple pan-cooked turkey cutlets would be good (and in keeping with the fall theme! ), pork chops would be yummy too, or even some kielbasa or tukey kielbasa. Thanks for the tip about smoked paprika and the heightening of squashes. Have to try that sometime. I still have a buttercup in the pantry. And I love the cardamom pecans! This sounds so yummy, a perfect hangover cure! And I’m with you about pancetta, it does make everything taste better. I too am obsessed with Fall ingredients I love this time of year! Hey, I am a regular reader of your blog, and have been planning to make this dish. I just adore whole grains and squash. Anyways, I was browsing serious eats this morning and there was a picture of this recipe with a link to your blog! Good luck with the goat cheese tarts, I voted for you.